The Stoughton festival for Syttende Mai attracts arts and crafts enthusiasts and artists who appreciate Norwegian culture and its role in the arts. 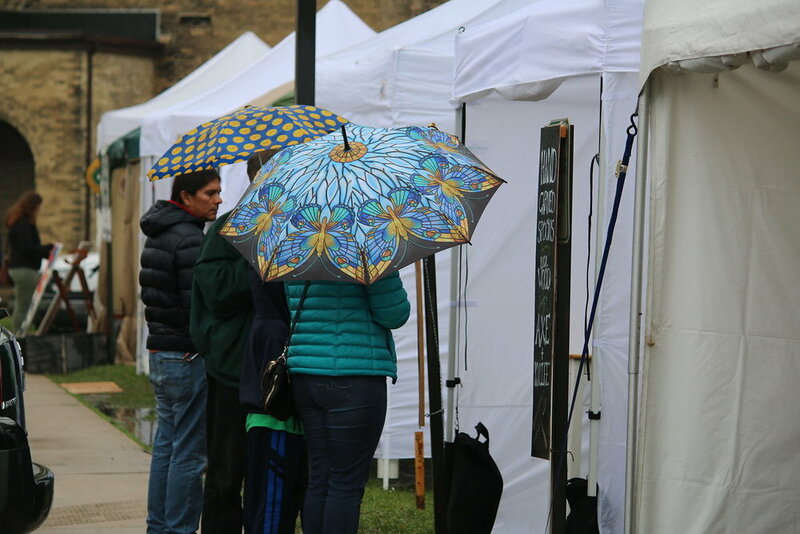 The Stoughton festival features an annual juried craft fair where artisans and artists show and sell their hand-crafted works. The Norwegian art of rosemaling, or decorative painting, traditional Norwegian embroidery and quilts are all on display. Many artists hold public demonstrations of how they create their works, too. It’s a great opportunity for Stoughton festival-goers to meet the artists and appreciate the art’s deep roots in traditional Norwegian culture. The Arts & Crafts Fair is a venue to showcase the works of art that support the spirit and intent of the Syttende Mai Festival. Mediums like rosemaling, woodcarving, painting, graphics, pottery, sculpture, ceramics, photography, handicrafts, jewelry, and weaving are encouraged. You'll find unique arts and crafts at the show. The event is held indoors and outdoors on the school grounds. Spaces are limited, and early applications are encouraged. River Bluff School is two blocks north of Main St., at the intersection of North and 4th Streets. You must submit the application form, S-240 tax form, and a photo of your work. Vendor information will be available early 2019. The annual Hardanger Embroidery Exhibit is a display of the intricate textile art from local embroiderers. The traditional Hardanger embroidery, or Hardangersøm, method involves counting the individual threads on a woven piece of fabric to create the geometric designs with both needle and cutwork. The technique can be traced to the ancient Middle East, but it traveled north to Italy, France, England and Scandinavia. Hallmarks of the Norwegian style include geometric designs with squares, stars, diamonds and roses on white or ivory fabric with white or ivory thread. Norway’s southwestern Hardanger region popularized this embroidery style and it remains a popular way to decorate traditional costumes or bunads and to embellish table linens and home décor. The Syttende Mai Hardanger Embroidery Exhibit features area artists who have learned their craft from Donna Olson’s Stoughton courses offered through the Madison College Adult Continuing Education program. Artists enrolled in the courses learn embroidery pattern design and charting as well as the needlework and cutting skills. Although the traditional Hardanger embroidery is on white or ivory linen, more modern items like bell pulls or holiday items may incorporate colored fabrics and thread. The Syttende Mai embroidery exhibit contains both traditional and modern embroidery work. Most items on display are table linens, but similar work can be found on other embroidered pieces like clothing, window treatments, doll clothes, frames, bell pulls and quilt appliqués. None of the pieces in the Hardanger Exhibit are for sale; artists will offer demonstrations throughout the three-day Syttende Mai festival. The Piecemaker Quilter’s quilt show has been a Syttende Mai tradition for over 30 years. Area quilters submit their work for judging and display. The show averages between 75 and 100 quilts or more with a range of themes, techniques, sizes and patterns. The show is open to quilters of all levels, skills and experience and also accepts antique quilts, so show attendees will view a variety of textile art. The public is invited to vote for their favorite quilt; Viewer’s Choice ribbons will be awarded at the end of the three-day Syttende Mai festival. Quilters with the top three most popular quilts will receive an invitation to display these quilts for the following year’s Syttende Mai festival Quilt Show. Each year’s Quilt Show invites a local quilter to be its featured artist. This artist displays as many as a dozen or more quilts for the public to view. The 2019 featured quilter is:. Rosemåling is the term for the bright, flowing Norwegian folk art painting that decorates many Norwegian wooden objects like furniture, frames and the trim around doors and windows. The artform began in rural Norway in the mid-18th century as an imitation of the intricate wood carvings common to the upper class. Its popularity faded 100 years later, but Norwegian immigrants brought the painting tradition with them to the New World on their colorful, painted trunks and revived the style in the U.S. The Stoughton rosemaling exhibit contains items on display and others for sale. 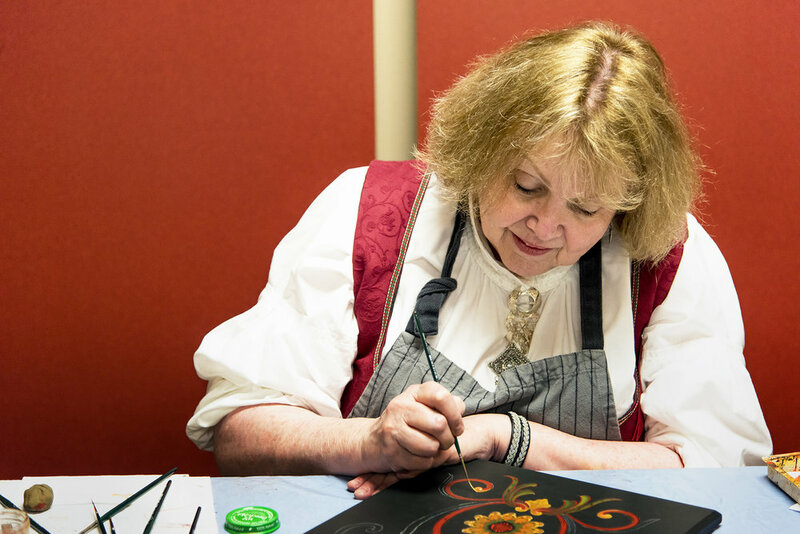 Local rosemaling artists will demonstrate their process. Stoughton is the birthplace of rosemaling in North America. Norwegian-born Stoughton resident Per Lysne established a thriving rosemaling business in the 1930s where he sold many painted objects and taught very few students. Lysne’s student and neighbor, Ethel Kvalheim, became one of the foremost experts in rosemaling in the U.S. Her work spread throughout the Midwest and popularized the folk art in the 60’s. The National Endowment for the Arts awarded Kvalheim a 1989 fellowship; she won the first gold medal award from the National Rosemaling Association; and she received the Medal of St. Olaf from the king of Norway for her contribution to Norwegian culture and art in the U.S. Her work can be seen in the Stoughton Home Savings bank. Both Lysne and Kvalheim’s work is on display at the Verterheim Norwegian-American Museum in Decorah, Iowa.